Here are some red hot thrift store goodies. Sweet dollies. Got these last week for 3.50 for the pair. They are a romping in a felted mohair meadow with a thrifted book in the background. This is an official boy scout jacket. It is so red they will be able to find me if if I go into the woods without my compass. Must have been an eagle scout because it fits me. And I am quite fond of it. These shoes are straight up dangerous. I almost passed them up because they are a tad impractical. But they fit... and you never know when you will need shoes like these. Better just to keep them on hand, in case of emergencies. Besides they have the "Good Housekeeping Seal Of Approval". Here are the delightful goodies sent to me by the lovelyAmanda Button . Peep soap bubbles in fruity flavors. A lovely fairy nest and a cd that was put on the stereo and homemade soap.. Yipee..
Go Visit and send the dear girl some positive mojo! She is a bright spot in the universe! I love that boy scout jacket and those shoes. Those shoes are for an excuse for a night on the town. Oooo,delicious thrifted booty! Love the little red pic!,,,and the ruby slippers,and the boy scout shirt! What a fantastic dolly photo op. Wow! 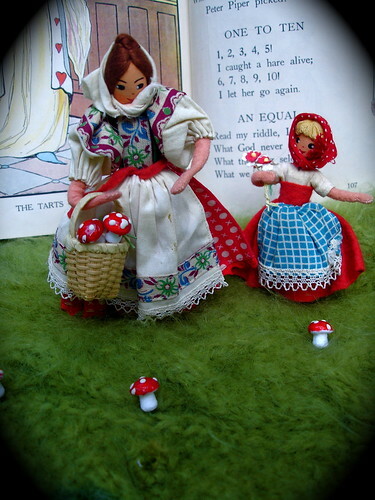 Little dolly girl trying to appease big, mysterious, slightly evil dolly girl who is out picking mushrooms. I didn't realize Good Housekeeping had a naughty side. great finds!!! i haven't had a thrift store outting that awesome in a long time, not since i lived on the west coast. you definitely need to make an outfit special to go with those shoes. Those shoes look like a pair I mysteriously lost when I was seventeen after a particularly hazy night drinking at someone's house in a particularly iffy building off of lower Polk Street. I think you have the magic thrifter genes. I agree with Futuregirl. Those shoes should be worn early and often. Impractical? Hardly. They go with EVERYTHING, especially the boyscout jacket! 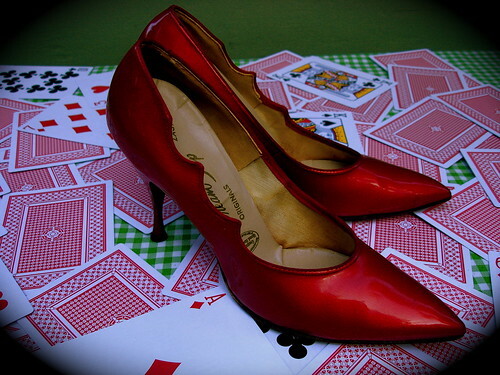 If I could wear heels I would wear those every day, even to take out the garbage. The top photo of the dolls is genius. 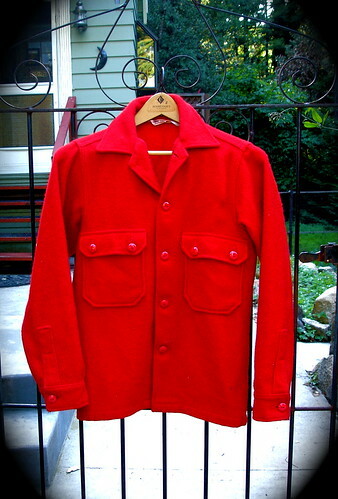 My dad was boy scout troup leader and he had that same coat. I wish I had that coat now, because I love red. And the shoes.. definately super hero shoes. Oooooo, thrifting adventures...And loot to boot! Oh, I do adore Amanda Button.. I have a faerie nest sitting in my tree....They are after us too...What fun!!! I had to check out your blog when I saw the name! Too funny and plain old FUN! I'll be bookmarking this one! yes, good thoughts to Amanda!! What a pile of loot!! What wonderful treasures. Now you'll be able to click your heels together anytime you feel lost and instantly transport yourself "home". I like the ruby slippers the best of all! I bow down in front of you, the Empress of all Thrifting. Oh, I love red! It always catches my eye. You lucked up on some really GREAT goodies! OOOOH those shoes! they would be perfect for a walk through the woods! gak!! does it never end? you are HOT!! definately red hot! !